I was keen to draw this view of St Paul’s before it vanished behind the new building on 2-4 Cannon Street. “PLP’s scheme, for global property firm Pembroke Real Estate, will replace a 1959 modernist office building by Theo Birks called Scandinavian House. The north facade, facing the cathedral, is the most orthogonally formal, with red sandstone cladding and a 3m window grid with anodised aluminium frames. 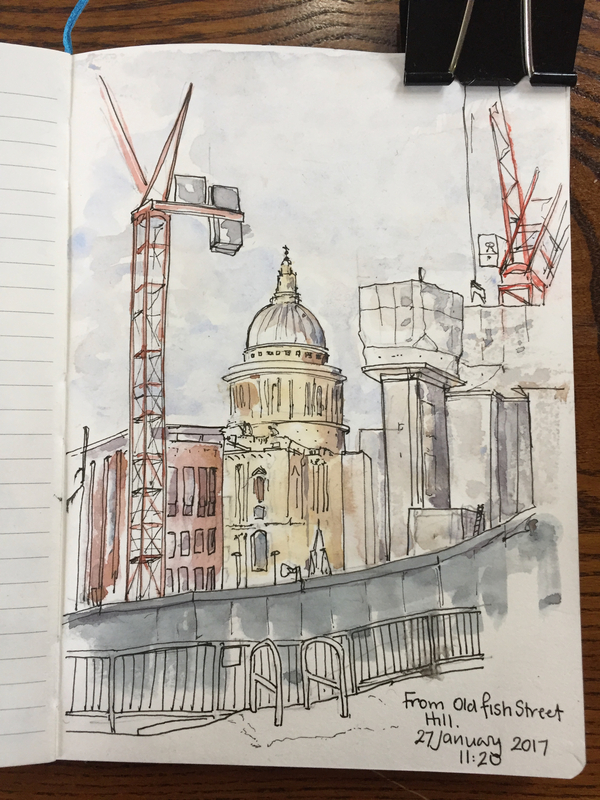 While I was drawing this, the traffic marshall of the building site came by, looked up at St Paul’s, and remarked that it was a “fine building”. It was extremely cold, about 2degreesC, and I was wrapped up in my Loden coat and furry boots. You’ll notice I invented a new watercolour technique. It’s called “greasy fingers marbling effect”. See the extreme right of the picture. Before I went out, I put a LOT of hand cream on my hands, because this cold weather makes my skin crack. But then after I had been gripping the sketchbook, I found the paint didn’t stick. But it’s quite a good effect, I think. I managed to complete the pen and ink drawing, and do most of the watercolour before the cold got to me. Then I retreated to the warmth of the Wren café in St Nicholas Cole Abbey Church. There I met Amy Marsh @harshmissmarsh who posted my work-in-progress on her Instagram. In the café I painted the red cranes. Coffee and a small and delicious Marmalade Cake, £6. They were just bringing out some delicious-looking lunchtime food. But I had places to go and work to do, so I exerted willpower and moved on. Towards the end of a weekend walk from North Greenwich to the wonderfully named “Maritime Greenwich”, I drew a picture from the park. Very cold. 45 minutes, sketch and colour on location. Dogs and people walked by. In the distance a baby howled, insistent and unceasing, as though crying for all our broken dreams. The headlines in the Evening Standard had described the pollution levels in central London at “Red Alert” levels. So I headed East to the clearer air and big skies of the maritime Thames. I drew a picture of the lighthouse. Above me, four stories of shipping containers contain offices. Words floated down. I was glad I’d drawn the roof adjoining the lighthouse. The building below it, on the right of the picture, is “Fat Boys Diner” with a Pepsi sign on top. I’ve not been in there yet. The Faraday Effect is the phenomenon whereby when polarised light passes through a magnetic field, the polarisation rotates. Faraday also showed that light is affected by magnet force. He discovered electromagnetic induction: that electricity can be made by rotating a coil of wire in a magnetic field. Hence power stations, and much else. There was a lot of light. The things in the foreground were dark, and the boat shone. The light-bulb shaped object on the left is a construction on top of a number of blue containers labelled “ENO” in the English National Opera logo. On the left is the lightship, which is red, called “Lightship95 Audio Recording Studio”. 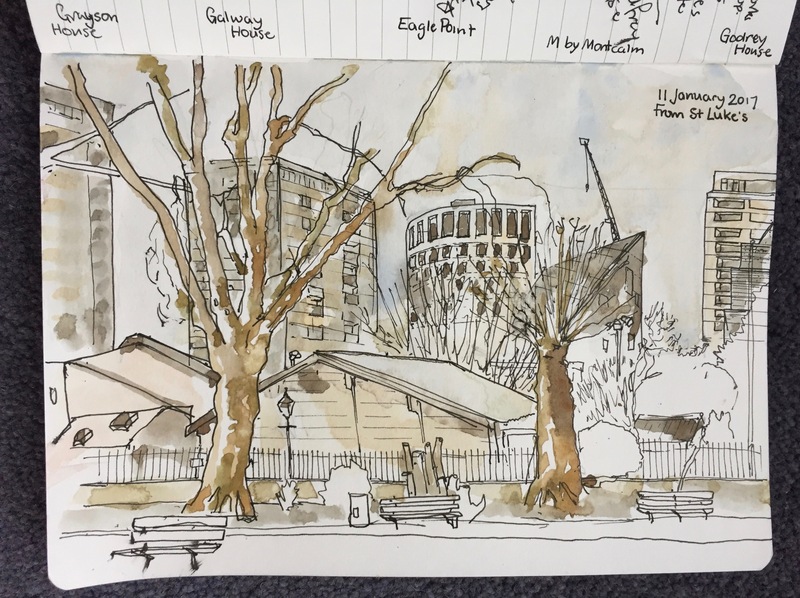 The Parish and Pilgrimage Church of Saint Magnus the Martyr in the City of London, drawn from a bench on the Riverside walk. Saint Magnus was Earl of Orkney, died 1118 and canonised in 1135. This is a Wren church, re-built 1668-1676, after the Fire of London. There has been a church hereabouts from at least 1128. This church has a marvellous porch and clock, in the shadow in the drawing, but accessible from Lower Thames St. A notice in the porch says “This Churchyard formed part of the roadway approach to the old London Bridge, 1176-1831”. Also in the drawing is the Monument to the Fire of London, another Wren construction, built 1671-77. Also in the drawing are a number of 20th Century office blocks. About an hour to draw, by which time it was dark. Coltash Court is the residential tower block in the centre of the picture. It’s 152 Whitecross Street, at the junction of Whitecross Street with Old Street. I can’t see when it was built – looks like 1960s. It’s labelled “Homes for Islington”, with Islington Council branding as well. A one-bedroom flat in there is advertised for £415K, “fully furnished”. I drew and coloured this standing up at the junction with Errol Street, outside Waitrose. 9:30 to 10:30, so about an hour. I used the convenient tables in the covered section outside Waitrose to put my painting things. But I couldn’t draw from there as I couldn’t see up the street. 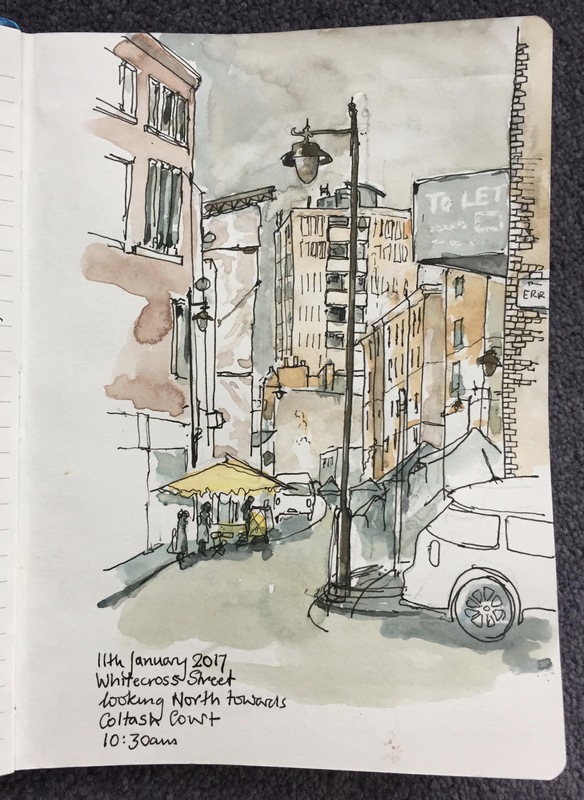 A vista of Islington development, drawn from a bench in St Luke’s Gardens. In the foreground the building with the pitched roof is Toffee Park Adventure playground. Social housing and ex-council flats. “Squire and Partners’ concept for the M by Montcalm hotel in Shoreditch was delivered in collaboration with Executive Architects 5 Plus, and completed in summer 2015. The site – opposite Moorfields Eye Hospital on City Road – provided inspiration for a striking facade which expresses the idea of the optical and the visual. Responding to the Moorfields Eye Hospital opposite, and taking inspiration from the 1980′s artworks of Bridget Riley, the facade is expressed as a triple glazed skin enlivened with differing patterns of transparency, opacity and solidity to convey diagonal slopes breaking across an underlying vertical structure. Manipulation and modulation of light, both internally and externally, give the facade richness and an ever-changing face on this prominent site, as well as assisting solar performance to create a sustainable development. The conjunction of the vertical and the diagonal create a visual effect of depth and movement, and express the activities taking place within the building. At the upper levels the facade openings become larger to express the more social uses and exploit the panoramic views. Drawn and coloured on a bench in the garden, about 1hr10min. The shouted response came, “Her mother’s a rottweiler and her father’s a Labrador”. The owner, limping across the park, informed them that the dog was “one step away from a wolf”. This was evidently recommendation. “She’s got rottweiler markings” he said. Once he’d gone, the interest in dogs continued. They called to a woman, and asked about her dogs. These were “A Labrador and a cocker spaniel”. The Labrador was called Debbie. They called to her, and the dog rushed over, bouncing up at them. While all this was going on, a woman with oriental features, without a dog, was walking loops of the park, looking directly ahead. 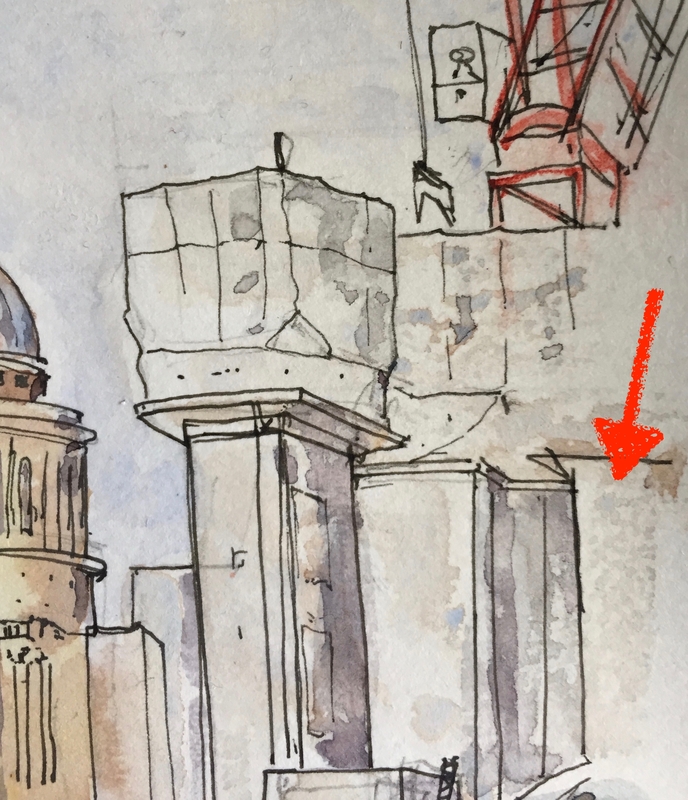 After the drawing I walked to identify the towers, via Radnor Street and Peerless Street, and had a coffee at Westland Coffee next to Eagle Point. This coffee, in a paper cup, cost £2.70. They did bring it to my table though. An etching created and printed at East London Printmakers. Basis of a New Year card. Ink on Fabriano paper, just under 12 inches by 6 inches, to fit in a 6inch square envelope when folded. The white line is sewing cotton, laid on the plate.